23 April: World Inspiration Day: The WORLD INSPIRATION DAY Logo & it's MEANING! Every nation around the world has a national flag that symbolizes that particular country and its ideologies. Every organization around the globe has a logo that represents the concept and belief systems of the founders. Every special day of the year is attached with a symbol that carves its remembrance in the minds of the people. Likewise we ie., team IU (Inspiration Unlimited) believed that there should be a symbolic representation for the World Inspiration Day as well. Hence we came up with the logo that has our philosophies in every layer of it. The logo starts with pitch black colour at the bottom. Black colour indicates darkness and every one of us initially are in the world of problems and commotions that fill darkness in our lives. Lots of people are chained in this level of negative emotions and are struggling to get out of there. While people are spending their lives fighting through the hurdles of life, they have to rise to the next level of challenging. The next level is represented by the blue colour which tells us that people have to swim across the oceans of troubles to reach age of prosperity. This ocean is huge and vast and shall take every ounce of effort from us. Blue colour symbolizes water that has the power of purification. Only after a man passes through this layer of purification of his soul can he reach the next level. The level above blue layer is a layer of grey. Man is rubbed against all troubles of life and tested to the core to see if he can come out successful. Battling through all these, he has to walk on stones of fire while every effort of his is burning into ashes with a hope to find his destiny. In due course, he might find himself melting into ashes. That’s the time to rise from the ashes like a phoenix into the higher level of purity and prosperity. Hence the next layer is white in colour to indicate the highest level of life which symbolizes total absence of inequality because the colour white is a combination of all different colours. At this level everyone is at the same level of purity of soul and prosperity of life. 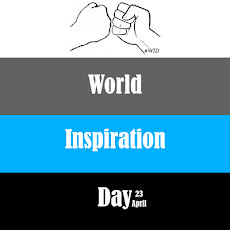 Happy World Inspiration Day. For any queries feel free to comment here! Thank you. Why are two fists hitting each other? Any Significance behind that?? ?